Conventional wisdom today says that to survive, companies must move beyond incremental, sustaining innovation and invest in some form of radical innovation. "Disrupt yourself or be disrupted!" is the relentless message company leaders hear. The Power of Little Ideas argues there's a "third way" that is neither sustaining nor disruptive. This low-risk, high-reward strategy is an approach to innovation that all company leaders should understand so that they recognize it when their competitors practice it, and apply it when it will give them a competitive advantage. This distinctive approach has three key elements: - It consists of creating a family of complementary innovations around a product or service, all of which work together to make that product more appealing and competitive. - The complementary innovations work together as a system to carry out a single strategy or purpose. - Crucially, unlike disruptive or radical innovation, innovating around a key product does not change the central product in any fundamental way. 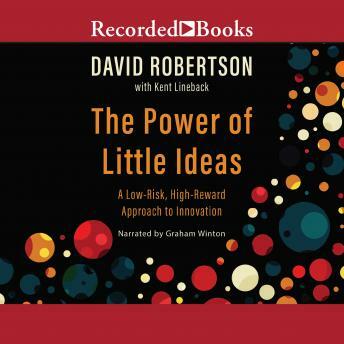 In this powerful, practical book, Wharton professor David Robertson illustrates how many well-known companies, including CarMax, GoPro, LEGO, Gatorade, Disney, USAA, Novo Nordisk, and many others, used this approach to stave off competitive threats and achieve great success. He outlines the organizational practices that unintentionally torpedo this approach to innovation in many companies and shows how organizations can overcome those challenges. Aimed at leaders seeking strategies for sustained innovation, and at the quickly growing numbers of managers involved with creating new products, The Power of Little Ideas provides a logical, organic, and enduring third way to innovate.